i am seriously irritated with myself... the whole reason i went to Ulta yesterday was to buy a new bottle of Seche Base... and i forgot! grrrrrrr. so i'll just be using Seche Clear for the moment because i don't feel like heading out there again... i hate it when i do stuff like that! today's 2012 China Glaze Prismatic Chroma Glitters collection polish is Ray-Diant. it's a yellow toned greenmicroglitter with a more blue toned green duochromatic flash. it also has larger multicolored glitter pieces, giving that added dimension. this glitter is green, but it gives a very gold vibe on my skin (light, light gold), it also seems to have so many different colors in it that it gives a rainbowish effect... it's hard to describe! 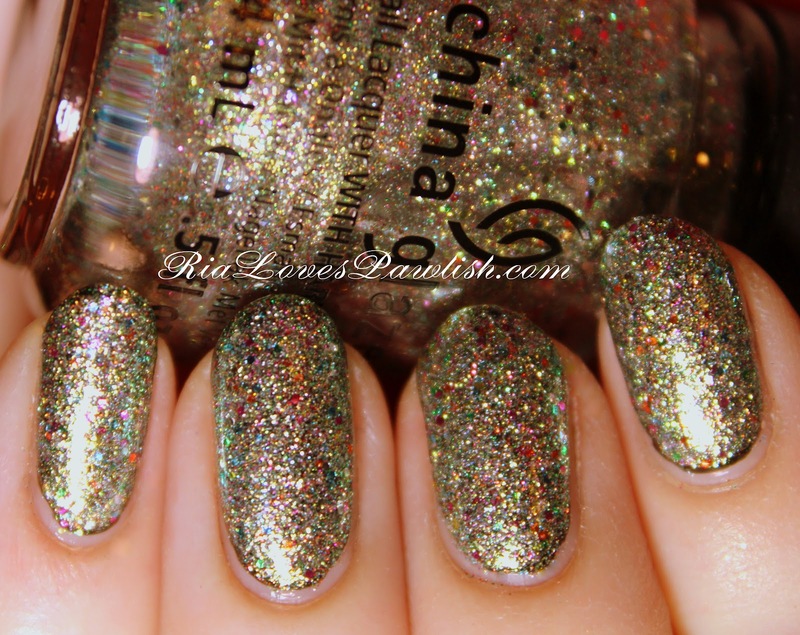 this is one is worth picking up, it isn't much of a looker in the bottle... but on the nails, BAM! the sad thing is that the flash isn't more noticeable... it wasn't super strong in the bottle, but it's even more faint on the nail. bums :( the formula is just like the other Prismatics, i tried a different method of applying the glitter (patting instead of brushing) and it didn't work for me... which is why three of the fingers have four coats! one coat Seche Clear, one coat OPI Black Onyx, three coats Ray-Diant on pinky/four on the rest, one coat Seche Vite.